The IAF was founded by a group of literary, visual, musical, and performance artists for the purpose of developing and promoting interstitial art. Just as how in nature the greatest areas of biodiversity occur in the margins of land between ecosystems, it is our belief that some of the most vital, innovative, and challenging art being created today can be found in the margins between categories, genres, and disciplines. Because such works are hard to classify, they are often misunderstood in a culture that has become overly dependent on branding and selling art by category labels. Border-crossing works of literature, for example, which consciously borrow tropes and themes from both genre and mainstream fiction, are classified as one or the other – and then critiqued according to the terms of that classification rather than on the book’s own terms, often to the detriment of the work in question. This happens in other areas of the arts as well: in visual art forced to declare itself as either “illustration” or “fine art”, for instance, when in truth it falls into the interstices between the two; in music labeled as “country”, “jazz”, or “roots”, when it actually utilizes elements from all those genres; etc. Though labels make for convenient marketing tools, they misrepresent the work of artists who don’t fall neatly into one category or another. Rigid categorization by critics and educators is an unsatisfactory method for understanding the border-crossing works to be found in all areas of the arts today. As interstitial artists from a variety of disciplines, we are increasing our visibility, claiming a place in a wider artistic and academic community. 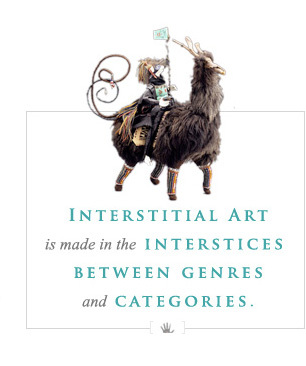 The mission of the Interstitial Arts Foundation is to give all border-crossing artists and art scholars a forum and a focus for their efforts. Rather than creating a new genre with new borders, we support the free movement of artists across the borders of their choice. We support an ongoing conversation among artists, academics, critics, and the general public in which art can be spoken of as a continuum rather than as a series of hermetically sealed genres. We support the development of a new vocabulary with which to view and critique border-crossing works. And we celebrate the large community of interstitial artists working in North America and around the world.